The equestrian spectacular Cavalia has taken up residency in downtown San Diego this winter. 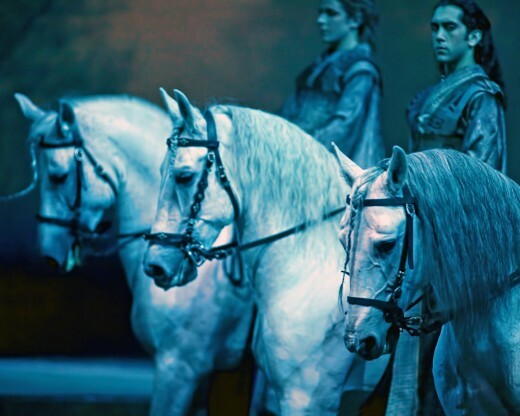 Cavalia chronicles the historical relationship between humans and horses. 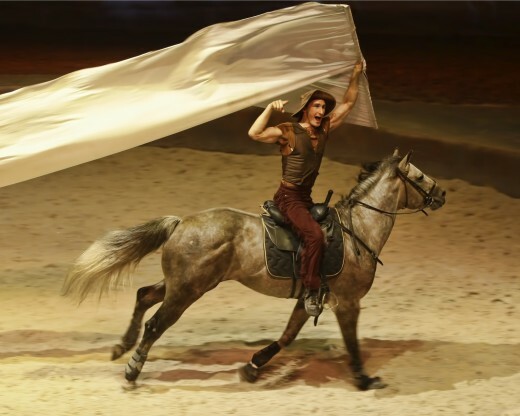 The nightly performance combines equestrian arts, acrobatics and theatrics (the creative team actually has roots with Cirque), a live music, special effects and lots of big production to take you on a journey through the historic and powerful relationship between horses and humans. Plenty of excitement and fun! In between the thrilling acrobatics are plenty of lighthearted and comical moments that will definitely make you laugh. One scene in particular plays up the vanity of a certain rider and his reluctance to do a thrilling trick, which he of course ultimately did. Look for the White Big Top right next to Petco Park in San Diego’s East Village. The producers recently announced that the show continue in San Diego through Christmas season. Tickets to a shows during a chilly December evening are the perfect gift for the horse enthusiast in your family. Enter for your chance to win a Family 4 Pack to see Cavalia during this magical Holiday season! 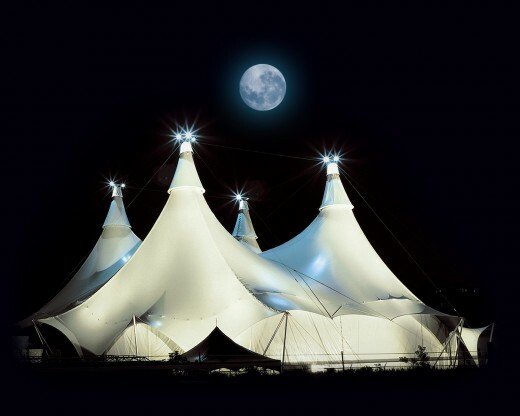 Win 2 Adult and 2 Child tickets for Cavalia’s December 26th show at 7:00 PM, playing under the White Big Top at Petco Park. Leave a comment below on why you want to see Cavalia. Duplicate entries will be filtered out and discarded, so adding additional comments won’t increase your likelihood of winning. Contest is open to all residents of the 50 States. Winners will be chosen randomly. One winner will receive a Family 4 Pack (2 Adult and 2 Child tickets) for Cavalia’s December 26th show at 7:00 PM. Entries (comments) can be submitted until December 7, 2012 at 10:00 AM PST. Good luck! This entry was posted in San Diego Events and tagged cavalia, cirque, cirque du soleil, downtown, east village, horses, Petco Park, theatre by Brian. Bookmark the permalink. Wow!! Looks and sounds amazing!! I am a vet tech in the Army, and of course I love animals!! This reminds me of the horses of the Calvary when they perform, but 1000 times more exotic! Would love to see this extraordinary performance. This would make a fantastic christmas gift for my family and I. To see the smiles on their faces would mean the world to me. The horses,and the entertainers look amazing. It looks just simply amazing! Would love to see it with my kids….Road trip from SF to SD! My step daughter is special needs and her love for horses is out of this world. It would be an awesome experience for her. We would love to just get out of the house and enjoy something really special as a family! My children love animals and want to see this show. Unfortunately, we cannot afford to buy tickets as I am currently unemployed. My children have never seen the magic between man and horse. My youngest child would like to be a large animal vet (i.e. equestrian vet) If we are chosen to win this great gift, it may give that much more inspiration. I have loved horse since I was 6. I have known horses and what they can do for a while. this show would be the epitome of horse/human connection and would be an excellent opportunity to see just how great that would be. Thanks. I would love to bring my kids to see this. We all love horses and would love to see what they do and how they perform in this show. I’m sure it amazing! Fellow equine friends who have seen this magical production couldn’t stop talking about it. Every year it comes and goes and alas, I’ve been unable to afford to go. I personally would appreciate the opportunity to see it in person and I would give the other tickets to my neighbor and their kids to share this amazing memory for the holidays. Great show for the Christmas season, horses are simply brilliant. I would love to surprise my 9 yr old horse crazy daughter for her birthday!! My family and I have always wanted to see the show but unfortunately cannot afford the tickets. I have not sob story, just would love to see Cavalia! its the harmony of human and nature. It doesn’t sit well with me that they want to charge me more for tickets because my mom is handicapped……boo to Cavalia! My girls love horses and this show looks so amazing unfortunately a 4 pack of tickets is well out of our price range, especially during the holidays. Maybe one day we will be able to see this magical show. The horses look beautiful and majestic – I imagine the show is magical – I want to be part of the magic. I love horses and it’s my 29th wedding anniversary in Dec. We need a night out doing something totally different! It’s been a hard year for my daughters and I. Horses have always been a part of my life and consistently have the ability to transport me from the everyday world to the surreal. I could really use that right now. I have heard that this is an incredible show and I would love to take my daughters to see it. They absolutely love horses. This would make a great Christmas gift for my whole family!!! I want to see Cavalia with my daughter because she loves horses. I have never seen a show like it so it would be really cool to experience. Would love to see the show and take my two kids… Looks amazing. So awesome! Would love to experience this show with my family during the holidays! Because horses are magical and we all need more magic in our lives. This would be a terrific gift for my precious grandchildren. I have never seen this show before; so I would LOVE to go! Would be excited to take some friends along too. Normally my husband and I go to Cavalia every year! Unfortunately my husband is on deployment this year, so he won’t be able to go with me. But I still want to keep the tradition alive and bring my some of my family with me! My mother is the biggest horse nut i have ever met and ever since she heard of the show in town she has been dropping hints that she wants to go see this show and i would be the best son ever if i could get her tickets and i like being the favorite of the five of us. Both my daughters love horses… the youngest learning from the oldest. My oldest has loved them since she was 3. We thought it was just a phase, since she had never seen a real horse and figured they might actually scare her when she did finally see one. Well, she is now 12 and her feelings and amazement for horses have not changed for a single day. This would be the PERFECT Xmas/Bday gift for them since they share their bday in Jan. I am a single parent of two children and would love to take my Kids to experience something new by watching cavalia in person. Both of my children and I enjoy a good play. This sounds like a wonderful opportunity to really experience the true essence of a horses’s spirit and what better way to wach the interpretation through the art of theater. Whenever I think of horses or see them, I think of my dad (who passed away in 2010). My dad always felt connected to horses because of his Chinese sign (he was born in the year of the horse, or so he thought) so our house was full of horse statues and pictures. It was a fond memory of him. I hope to get the opportunity to see this show! This looks like an amazing show. Would love to be there with my 6 year old daughter and her friend. This is at the top of my list for Santa this year! I recently relocated & looked into buying tickets to see Cavalia but could not afford. This show looks amazing! I would love to take the family to see Cavalia. I would absolutely love to see Cavalia with my family! I have loved horses since I was a kid. This show looks incredible. After recently relocating it would be an excellent boon to an otherwise lonely holiday away for my family. I also have a great passion for horses. I’ve heard a lot about this show and have been wanting to see it! I have never been in a live show before. Currently I am living with my stepmom and 2 others. We rarely have enough financial to go to see a liveshow. My stepmom loves horses, her dream is to seeing an spectacular show like Cavalia. her birthday was 3/12, but we didn’t go to any luxurious restaurant or go to somewhere to celebrate together. I bought her cake from Vons and she was really happy. I definitely believe that if she can see this show it would be the most memorable gift that I can give her. My mother is a middle school teacher who has been caring for her uncle, whom we are his only family he has left. She has been dealing with medical decisions and well as keeping his personal/money issues straight while still judging teaching Junior High kids. As a lifelong horse lover, show jumper, and summer camp director teaching horsemanship, this would be the PERFECT Christmas gift for us to enjoy together! Heard it’s a wonderful performance that no one should miss! I would love to take my family to such an amazing production! My niece would give anything to see this. Heard it was amazing! My son is obsessed with horses and would love to see something like this. This year he was stepped on by a horse (he is only 2) but it has not diminished his love for the animal at all. This would be such a treat for him! My brother lives in San Diego. He just got married last month and our family was not able to make the ceremony. I think this would be a great way for him to introduce his new wife and stepdaughter to California. My husband grew up raising horses and everything about him is cowboy. He has been out of work for a year now and just can’t catch a break.We have very limited funds so our twin boys only received a cake for their birthday last month. ( They turned 12). I would love to be able for the three men in my life to have a well deserved evening watching this beautiful show….please…..
I’ve heard wonderful things about the show and would love to see it. I’ve heard a lot about this show and would love to have the chance to check it out with friends and family! Our 2 daughters love horses and I keep seeing this commercial and wishing I could afford to take them. It would make such a great Christmas treat for them. Thanks for the opportunity! I’d love to take my family as a special treat while the kids are on Christmas break from school. My mother in law absolutely loves horses, my wife and daughter love the beauty of acrobatics. The last time my mom has been to a show of this type….well I can’t remember. Would be a SWEET gift for the best mother in law a guy could ask for! I would love to go see it. It looks amazing and I would love to show my daughter. My friend and I were actually looking into tickets, but they were expensive. The horses are so well trained and it just looks like so much fun!! Having ridden and shown my Arabian horse when I was in elementary and middle school, I’d love to see the Cavalia show and reconnect with that love for horses. Knowing that this will be a creative and entertaining show is all the more inviting. Plus, I can only imagine the joy on my friends’ kids’ faces as their eyes are opened to the beauty of all things equestrian. Horses have been a major part of my life since I was a little girl. They are the most majestic creatures that I have ever seen. Seeing this show would transport me back to when I was a little girl and get to see the magic of horses again.